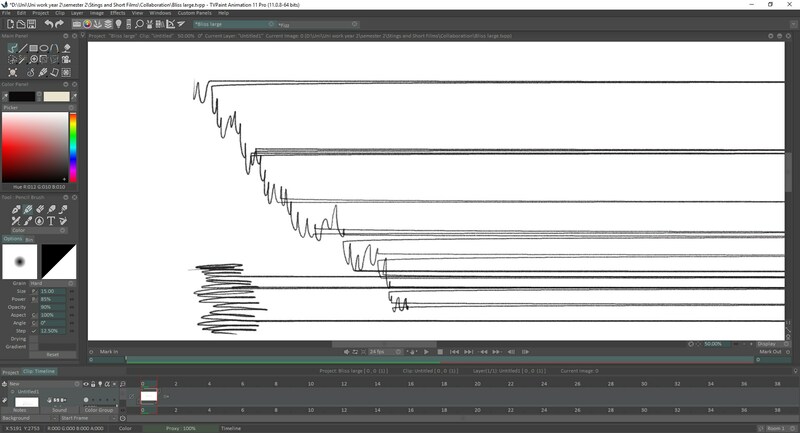 TVPaint Drawing random straight lines at beginning of stroke. - Welcome to TVPaint Community forums ! A quick query regarding a bug i keep running into. Every time i attempt to draw circles/curves freehand i seem to get strange straight lines at the beginning of the stroke. It only occurs if i draw fast. Previously I have had a similar bug where straight lines shoot across the entire screen horizontally, though that problem doesn't seem to be occurring anymore. However this is dated 2008 and seems to have been resolved so i'm skeptical that it is the same issue. Re: TVPaint Drawing random straight lines at beginning of stroke. I was wrong, the horizontal lines problem still occurs. its just not as easy to recreate on purpose as the curved line problem - though i imagine they are related. From time to time I've had similar anomalies. I don't use a Cintiq but I do have two monitors, side by side. I runTVPaint on the left monitor and other software on the right monitor. 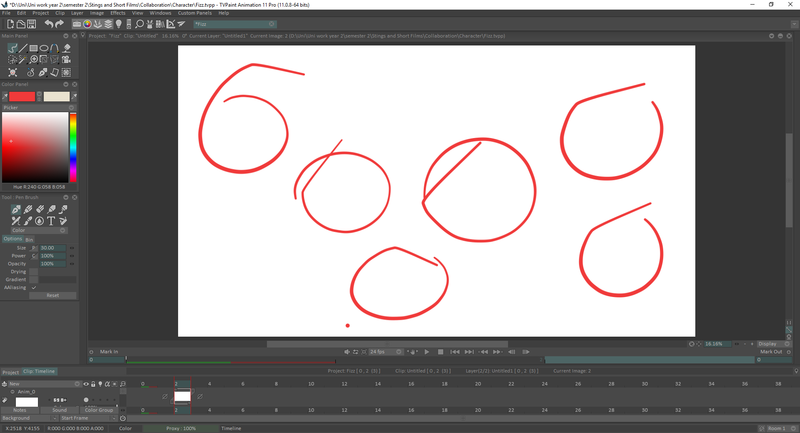 When I move between software on the right monitor where I use a mouse, and then move to TVPaint and use my Wacom Intuos on my left monitor, I can reproduce the same anomalies you show here by momentarily moving or even just touching my mouse while in the process of drawing lines with my stylus on the TVPaint screen. Note I am moving the mouse without pressing LMB or RMB or scroll wheel. So, what may be happening in your case is drawing on the Cintiq may be causing slight movement in your mouse resulting in the spikes to the right side of your Cintiq. Or maybe not... but it is something to check. Does this happen with pen only, or with the mouse as well? Svengali was right, it seems the horizontal lines are caused by mouse input on my other monitors (caused by my desk shaking) - which is easily fixed by simply flipping/unplugging my mouse when i use TVPaint. Unfortunately the other issue - straight lines at the beginning of a curved stroke - still remains. I have no idea what could be causing it. It only happens with the pen. Try going into Wacom Tablet Properties and selecting your pen, find Tip Double Click Distance and turn it off. You can also try disabling Press and hold in Windows Flicks panel. Open Control Panel > Hardware and Sound > Pen and Touch > Go to Pen Options tab > Press and hold > Settings > Uncheck "Enable press and hold for right-clicking" > Go to the Flicks tab > Uncheck "Use flicks to perform common actions" > Apply. Also try opening the Wacom Tablet Properties panel again, selecting your pen, go to the Mapping tab and uncheck "Use Windows Ink" (at the bottom of the panel). That fixed it straight away. I'm ashamed i hadn't tried that myself, probably could of worked it out with a bit of trial and error. One of the best things about TVPaint has to be the community! Really fast knowledgeable responses. I'm very impressed. The issue of the straight line starting at the beginning of every attempt at drawing was a confounding problem. All other programs did not have this issue,,, so I do not believe the issue is just a hardware issue, something else is going on with the way TVP talks to this set up. I had to take the remaining final steps to get the stylus to behave like a drawing implement instead of a beastly inefficient technologically induced tantrum/glitch. I removed the USB mouse ( logitech) I had plugged in ,,, and am using a bluetooth mouse in conjunction with the wacom drawing stylus that came with the cintqu. Shutting down computer and restarting is also a factor too, and I did do that many times in the process. but I know that it is impossible to use TVP if every stroke behaves errantly, so resolving this issue is a major factor for anyone having the problem. I had been experiencing a particularly pesky pen stuttering problem for a long, long time and finally hit the solution after I turned off EVERYTHING connected to the Pen and Windows Ink settings in Windows 10. Not just one over all setting that would seem to discontinue all Windows ink items but I went through every box and turned off everything possible to leave the box empty or say "Nothing". It is also important to turn off INK in the Wacom software (Mapping) and use TVP's Wintab/SubPixel setting under Preferences. Judging from where you are in your hopeless situation try this; it might help. Just another guess because I feel for you. Hello! I am having this same problem! (The straight line at the beginning of the round shape. Also, in a curved line, it can be blocky- as if made up of straight lines. I’ll try some of these resolutions but I see that many of these seem to be rooted in Windows and I am on a Mac OS so wanted to see if others are having this problem on Macs. I have the new 32” Ciniq Pro, on a new iMac, and using TVPaint 11 Pro. I’m also experiencing a good amount of lag in the drawing, which may or may not be related to this problem. All of these are MAJOR problems and I’ve been trying to fix everything for a week now. Did install the newest Wacom driver and even upstairs my OS to Majave in case any of that was the problems. Hi Tom, Im on a Mac and experiencing the same problem, as many other TVPaint users. I'm not sure if the Tech Team is aware of this, since there is almost no feedback on their side regarding this issue.